Bigg Boss Tamil Season 2, The Grand Opening promo video has been released by the channel on official social media pages and YouTube channel. 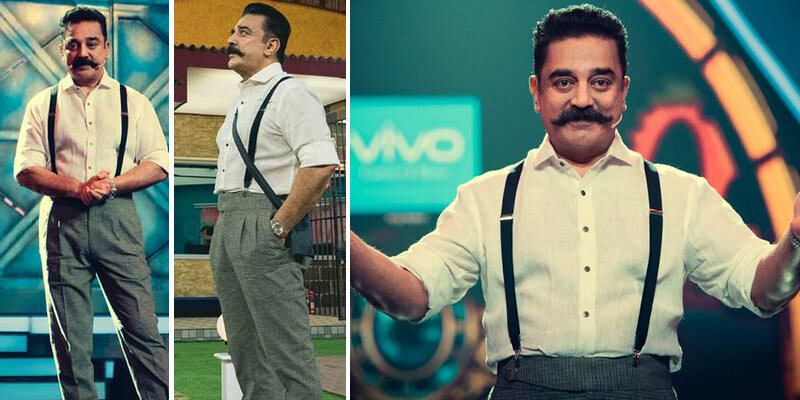 The host Kamal Haasan appeared with a wild west mustache and suspenders as shown in the picture which was shared in his Instagram. The channel has already started the countdown for the Bigg Boss grand opening. Kamal Haasan frequently appearing on Television and keep remembering the people that the show will be started at 7 pm on Sunday. Early this week, few media people had a visit to the new Bigg Boss house and also shared the photos. Check Bigg Boss Tamil 2 House Photos here. A big house was built with full of yellow, blue, and pink as most. This time, the channel also tried new promotional to get viewership as more than last season. People can set Bigg Boss Tamil theme music as a caller tune of their mobile number. Just SMS as BBT to 57827 to set the music as your caller tune. According to the sources, following people will be expected as the opening housemates of this season. Actor-producer Power Star Srinivasan, actor Bharat, actress Mumtaj, and popular DJ, but the official list to be out after 7 pm, tomorrow. In the last season, the host simply appeared on the show as an actor in the profession. But, now he is a politician who started a political party in February this year. He expressed his emotional and angry in the episodes of the first season and also confirmed about his political entry in the Bigg Boss final stage. So, now the people of Tamil Nadu can expect more from him in a political way also on following episodes. Stay tuned for more latest updates of Bigg Boss Tamil season 2!